Not every entrepreneur wants to build the next big company by disrupting an entire industry. But even if many entrepreneurs and their employees are happy staying small and flexible, the capability to disrupt themselves and/or their competitors is often the only way to stay in business. Because of the limited resources available to them, SMBs can become quickly destabilized by even just one poorly performing employee, an aggressive local competitor, changing regulations, and other ostensibly minor circumstances. 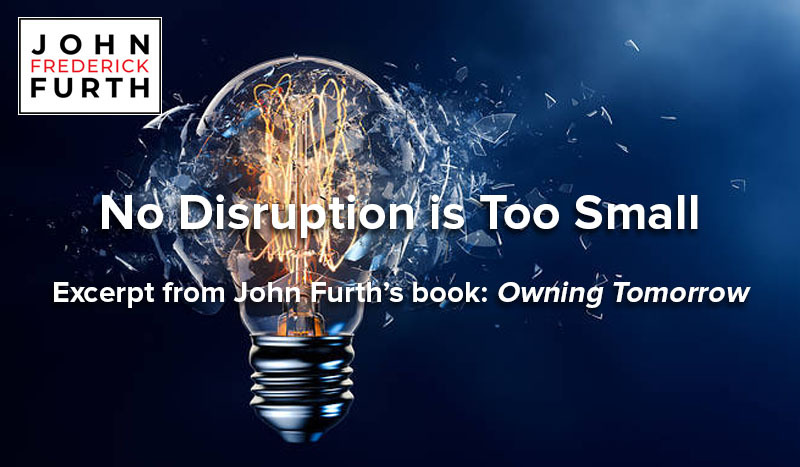 Unfortunately, many CEOs of outwardly successful SMBs downplay the need for these small disruptions out of fear of destroying what they have built or preferring to go into stealth mode until they are more confident. Others become hamstrung to the point that they can clearly see disaster looming on the horizon and yet do nothing for years until it’s too late. But even the most successful CEOs and their teams can become complacent if they don’t watch out. Some get so overwhelmed by the day-to-day demands of operating their companies that they resist any disruption because of the uncertainty and risk that comes with such an endeavor. Many leaders develop blind spots that make it virtually impossible to know when and how to disrupt aspects of their businesses that are no longer working. Most don’t even know what disruption is and how powerful it can be when done right. When I met Peter, he was running the company he had founded fifty-one years earlier, selling tires just-in-time to local garages for same-day automotive repairs. While his ability to sustain a company for so long is was admirable, the fear of losing everything just before he retired made it difficult for him to justify making any significant investments or changes. The irony, of course, was that his unwillingness to disrupt himself, his company, and his competitors almost put him out of business. Peter had watched as his local competitors were bought up by larger enterprises over the years. He knew that these increasingly large companies had the capital to invest more in new technology and people as well as the purchasing power to demand lower prices from the leading tire manufacturers. At the same time, he had allowed his organization to grow weeds by not letting poorly performing employees go and by hiring people who may have been affordable for a company working with tight margins, but who often turned out to be highly problematic. Peter’s girlfriend, Susan, clearly understood what was going on and pushed him to at least make improvements to his company’s hiring and development processes that didn’t cost a lot. We both knew that underneath Peter’s gruff exterior was a truly wonderful and caring human being and a champion triathlon athlete who was trying his best to get his company where he knew it had to be. The real break-through came on a very warm August day as he and I were sitting on his apartment balcony overlooking East Seventy-Fourth Street and York Avenue. As usual, Peter was telling me all the reasons he couldn’t make any major changes while complaining bitterly about his competitors and employees. I was once again trying to explain things he could do to fix the problems. Even though he was writing down everything I was saying, I knew he would go back to the office and get so wound up in the day-to-day operations of his business that he’d forget about the ideas we had discussed. Determined that this time I was going to get him into action, I threw caution to the wind: “Peter,” I said, “all you do is give me hundreds of reasons why you can’t do anything. You’ve been in business for fifty-one years. You know exactly what you have to do.” Peter paused, thought for a few moments and eventually put his pen down. He then proceeded to outline exactly what he needed to do. He indeed took action and let several employees go, especially salespeople who kept missing their targets and were otherwise underperforming. To clarify roles and expertise, he reorganized his sales team into two different groups: business developers, who would be out on the road wooing clients and reminding them of his company’s quality service, and experts who would answer phones and not only ensure customers got exactly the tires they wanted when they wanted them, but who also could offer other products Peter had recently added to his product line, like batteries, etc. These experts could also recommend alternative products if a customer’s request was out of stock and/or upsell customers on better tires as appropriate. New metrics and commission structures accompanied this change. Peter invested in an e-commerce site and started selling tires through Amazon. Peter had convinced himself he was a lousy manager and he wouldn’t believe that his employees were there because of him, and not in spite of him. He finally understood how much his team valued him when he started organizing regular team meetings and made more effort to talk with his employees instead of communicating via email. Peter’s mood brightened and he relaxed enough to begin telling jokes again. A year later he had implemented enough improvements to attract a suitor who eventually bought his company, giving Peter enough of a financial cushion to pursue his athletics and other interests, something he had certainly earned the right to do.